Our Travel Experts have put together a packing list for safari. This guide is a good starting point, but we recommend writing out your own check list and adding all your personal items. 1) Luggage. 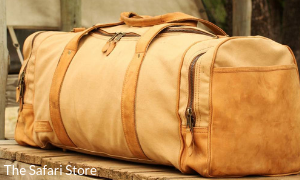 We recommend you use a large soft bag for safari, keeping the weight at 20kg (44ibs) or less. If your safari includes a light aircraft flight in Africa, as many do, you cannot use a hard suitcase or one with wheels and a pull handle. 2) The season you will be travelling. Please remember summer months are generally September - April and winter months are May - August. During the winter months it can get cold at night and in the early morning, particularly when on safari. We would suggest that you pack accordingly. 3) Do not to over pack. Remember our lodges tend to offer laundry services which are usually complimentary. For ladies a silk scarf is recommended. For walking safaris sturdier footwear is required, as such closed walking/ safari boots. 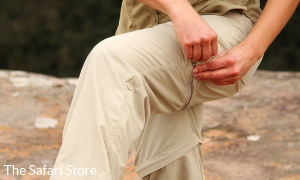 Two pairs safari trousers (ones that can 'zip-off' into shorts are best). 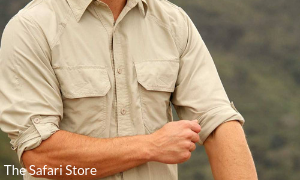 Remember - Mahlatini customers get 10% OFF at The Safari Store.